This is a great mid week meal in mins , when time is short and you don't want to compromise on taste and flavour. So long as you can boil water, chop a shallot and switch on your cooker, This will be child's play for any novice or aspiring cooks. Come on , let's get cooking !!!! Blanch the gnocchi in boiling water until they float back to the top , Count to 30 sec, remove and refresh in cold ice water . In the same pot, blanch the asparagus for 1 mins, remove and refresh in ice cold water as well. Chop the asparagus into 1 cm chunks reserving the tips intact so as to use as a garnish. Heat up the oil in a frying pan, lightly fry the chicken but without much colour. Add the butter and allow to melt and foam up. Add the shallot, Vermouth and chicken stock. Turn down the heat and allow to reduce until the chicken is nearly cooked thru. 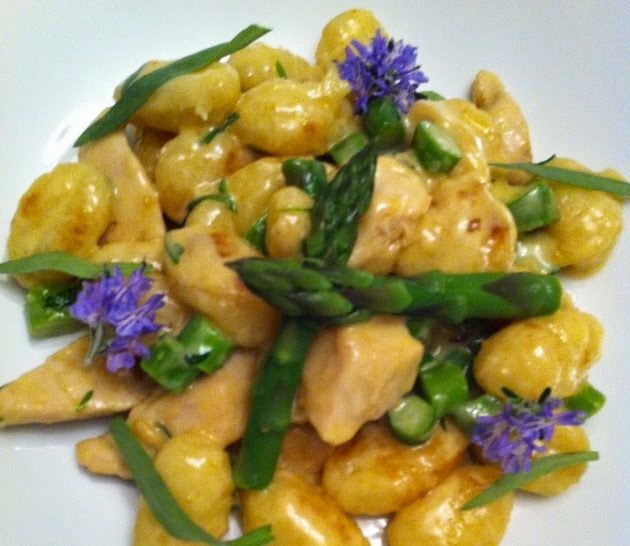 Pour in the cream, gnocchi and Asparagus. Season to taste and finish up with the chopped tarragon. Serve immediately. · Substitute the Asparagus with peas, broad beans or broccoli. · Serve with grated Parmesan .